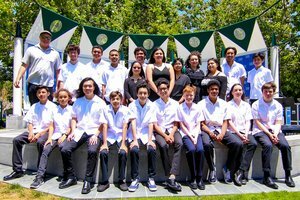 The Latin Jazz Youth Ensemble, San Francisco’s highly regarded music program teaching and preserving Latin jazz, will present their 18th annual Reunion Concert on Sunday, January 6th, 2019 at 7 pm.. Several graduates who are now performing professionally will return for this once-a-year treat. Expect exciting interpretations of Latin jazz standards as well as original music featuring stellar solo instrumental work, soaring vocals and original compositions. The LJYE is proud of their alumni, many who have gone on to perform with some of the top musical artists in the world. This show will move you with it’s infectious Latin rhythms but also with it’s inspiring story of how a community grass-roots organization can produce enormous talent for the past nineteen years, completely free to the students. Music Director John Calloway, Ph.D., has created a legacy of Latin jazz players for generations to come. All student musicians ages 10-18 are welcome to audition for inclusion in the ensemble. More information is available at ljye.com.